Quiz the Coach :: Volleyball Coach Chaos! I play volleyball and my coach is really mean! Why are all coaches mean? It seems like she only hates me... but when we play she always puts me in the first and last game. She says she only puts people in the last game if they played hard… that makes me feel good but she is always in a bad mood at practice and even when I try my hardest she is always like "you need to always be getting the ball! '”… even when I can serve 7 points in a row and I am always diving to get the ball when there’s other people who cant even serve and are scared to dive!!!!! It sounds like there is a lot of anger on your volleyball court and that is exactly the opposite of what the game is about. Volleyball should be fun and whether or not you win or lose, as long as you are trying your best, that’s all that really matters. Kill em with Kindness – If you have a good attitude no matter how mean your coach is to you, there’s a really good chance that she will start being nicer to you. Be Positive – Most great athletes will tell you that the secret of their success is to always be positive no matter how difficult things are. 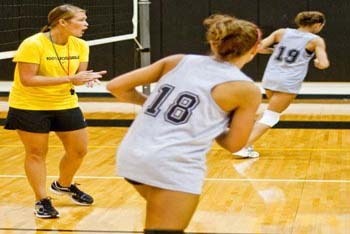 Communication – The next time your coach is upsetting you by being mean, wait until the end of the practice or game, and ask her if you can talk to her about it. Tell her that she made you upset and it might be making you play worse. Always Avoid Anger – The worst thing to do is let your coach make you angry while you are playing volleyball. Anger is a distraction that can make you play worse. If you are thinking about your coach being mean while you are playing, you can lose focus on your skills and the ball. Volleyballgirl, you’re almost right. A lot of coaches are mean… not all of them, but it’s true that a lot of coaches are mean because they think that it will make their athletes try harder and win more. But usually it’s all just an act. Deep down inside, all coaches really want to make their players better at sports. So try to take it with a grain of salt and smile. Maybe one day you can be a coach and try to be really nice to your players! Which Celeb Has a Life Coach?